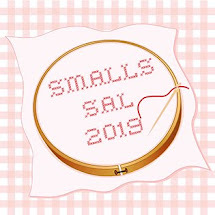 It was a great progress-filled IHSW this month so I am very happy. Then I continued with my Hallowe'en project which is Jardin Prive's Happy Hallowe'en Night. 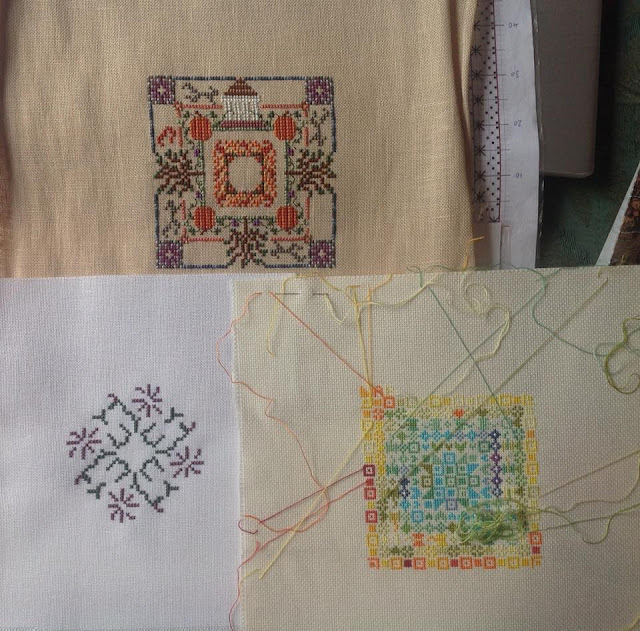 Stitching one motif per month to tie in with the Hallowe'en Ornie Blog SAL. This month was Haunted Houses and it was a big one! That might look like a pumpkin, but it's actually a Christmas Teapot! 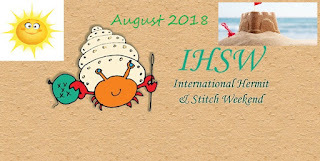 Finally, the next IHSW will be 21st - 23rd September so make sure you note the date in your diary or come and join us in the Facebook Group - IHSW on Facebook. If you don't do Facebook then you can check in here. 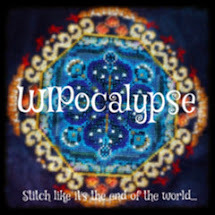 Beautiful progress on your WIPs. Love your Halloween piece. I need to get my GG post up. Also progress on my IHSW...Love your progress especially on your daily projects. Wow! Lots of great progress. I love the temperature project! No, I'm certain that's a pumpkin, not a Christmas teapot. I like the parked floss around the temperature SAL. It's a good reminder of how crazy the weather has been! Alice looks like she's patiently(?) waiting for her other arm. Great progress. I love seeing progress. 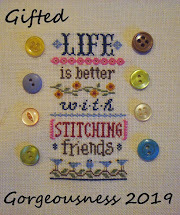 You certainly had a productive weekend....you got lots of stitching done. Each project looks wonderful. Love your temperature SAL. Will have to do it next year! Awesome progress Jo. I love the Halloween piece. Alice is looking amazing. I'm still plugging away on mine. I WILL get it done by the end of the year. 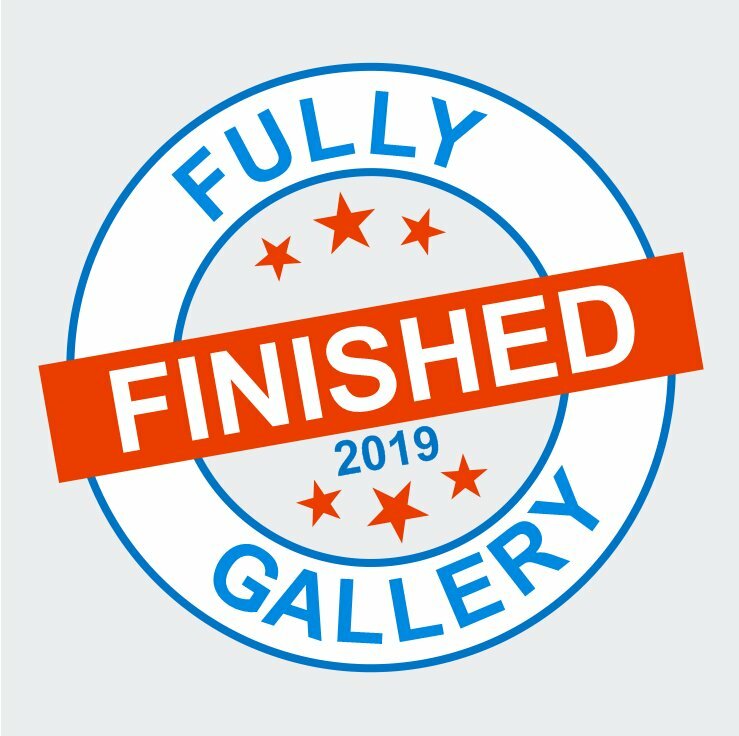 Well done Jo loads of progress . Jo: My goodness your Alice is amazing, you are making great progress on all your designs. Great stitching progress! I do love Halloween Night. The linen color is perfect! How cute is Alice!! You have made wonderful progress on her, Jo (not to mention all of your other cute projects!!). I really love the fabric for the Halloween Night piece. Enjoy your day! Your permitting weekend went perfectly well with lots of progress, didn't it? It must feel great to work on so many different projects. You were busy, Alice is looking great, loving the JN Autumn in the Garden too. Lovely progress! I was traveling this month, and while I spent a lot of Sunday inside the hotel, the light was terrible, so not much stitching happened. I'll make up for it in September, though! I am loving your Halloween! And yes, you fooled me thinking that will be a pumpkin teapot. Yay, the flamingo is showing itself!